“Knock on wood somewhere,” said the Erie Otters captain after hearing that OHL teams have combined to win 12 straight games at the tournament since 2014. The Otters extended that streak to 12 in dominant fashion Monday with a 12-5 win over the QMJHL champion Saint John Sea Dogs. “For whatever reason, the OHL was strong this year,” said Strome, who set a Memorial Cup single-game record with seven points (four goals and three assists). An OHL team hasn’t lost a game in the Memorial Cup since the Guelph Storm were defeated in the final by the Edmonton Oil Kings in 2014. Since then, the Oshawa Generals (2015), London Knights (2016), Otters and 2017 host Windsor Spitfires have gone 12-0. 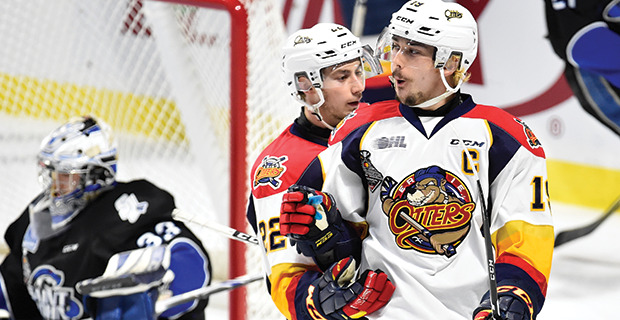 Monday was also a record-setting night for the Otters as they set the tournament’s single-game record for goals by a team in one game, a mark that was previously set by Quebec in 1974 and Regina in 1980, each with 11. Taylor Raddysh recorded two goals and four assists to tie the previous record of six points in a game. Erie’s win moves them up to 2-0 sets up an exciting game against the 2-0 Windsor Spitfires as both teams will look to win Wednesday and finish first in the round robin to advance straight to Sunday’s final. While setting records was nice, Strome said the Otters need to zero in on the next task at hand. Another crucial matchup lies ahead for the Sea Dogs and Seattle Thunderbirds Tuesday night. They’re both 0-2 and need to win in order to stay alive and move on to Friday’s semifinal against the loser between Erie and Windsor. The one thing Sea Dogs defenceman Thomas Chabot took solace in was knowing there’s a short turnaround to try and get into the win column. “That’s the good thing about hockey, not even 24 hours later, you have the chance to go right back at it,” he said. Darren Raddysh (two goals and two assists), Alex DeBrincat and Anthony Cirelli (each with a goal and three assists) each had a four-point night for the Otters. Kyle Maksimovich and Ivan Lodnia rounded out the scoring for Erie, which outshot Saint John 39-23. Cédric Paré scored twice for the Sea Dogs, Mathieu Joseph finished with a goal and an assist, Chabot picked up two assists and Spencer Smallman and Julien Gauthier also scored. Following the loss, Saint John coach Danny Flynn was relatively subdued, giving full credit to Erie for playing an excellent game. The Thunderbirds enter Tuesday’s game after a tough loss as well. They gave up three quick goals off of turnovers within the first six minutes on Sunday en route to a 7-1 loss to the Spitfires.